Udall JN. Infant feeding: initiation, problems, approaches. Curr Probl Pediatr Adolesc Health Care 2007:37:374-99. Poinso F, Viellard M, Dafonseca D, et al. Les anorexies infantiles : de la naissance à la première enfance. Arch Pediatr 2006:13:464-72. Chatoor I, Surles J, Ganiban J, et al. Failure to thrive and cognitive development in toddlers with infantile anorexia. Pediatrics 2004;113:e440-7. Abadie V. L’approche diagnostique face à un trouble de l’oralité du jeune enfant. Arch Pediatr 2004;11:603-5. 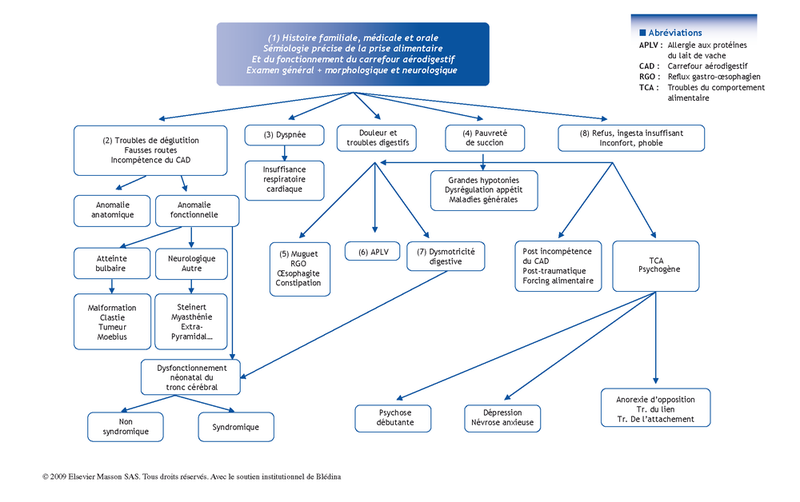 Abadie V, André A, Zaouche A, et al. Early feeding resistance: a possible consequence of neonatal oro-oesophageal dyskinesia. Acta Pediatr 2001:90:738-45. Stevenson RD, Allaire JH. The development of normal feeding and swallowing. Pediatr Clin Nth Amer 1991;38:1439-53.